Abstract: The works of Tolkien and the Book of Mormon have been compared in a variety of ways by multiple authors and researches, but none have looked specifically at the unusual names found within both. Wordprint studies are one tool used in author attribution research, but do authors use specific sounds more than others — consciously or subconsciously — when selecting or inventing names? Some research suggests they may and that their patterns could create a “sound print” or phonoprint. This constitutes a fresh and unusual path of research that deserves more attention. 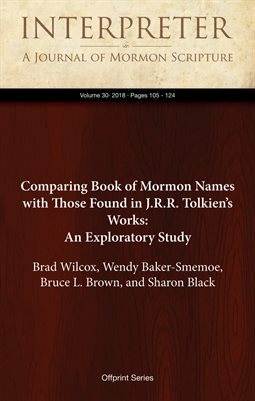 The purpose of this exploratory study was to see if phonoprints surfaced when examining Dwarf, Elf, Hobbit, Man, and other names created by Tolkien and Jaredite, Nephite, Mulekite, and Lamanite names found in the Book of Mormon. Although much more research needs to be done to establish the validity and reliability of using phonoprints for author identification, this study opens a door for future research.